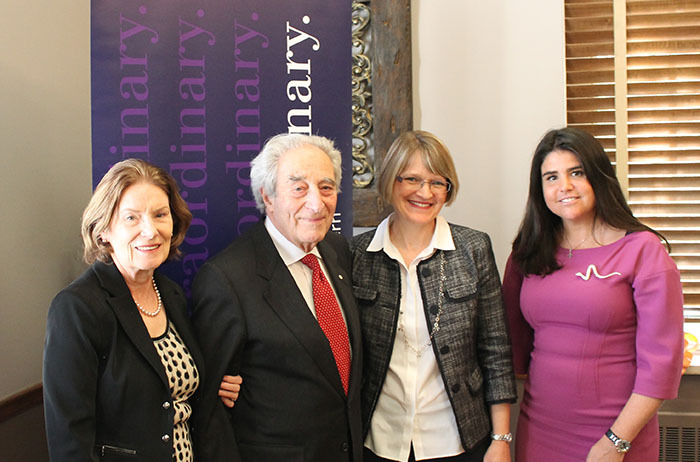 Mary Kay O'Neil Lowy, Frederick Lowy, Director, The Jarislowsky Foundation, Audra Bowlus, Chair, Department of Economics and Eve Beauchamp, Executive Director, The Jarislowsky Foundation, following the announcement of the $2-million gift to establish the Stephen A. Jarislowsky Chair in Central Banking. The Faculty of Social Science has received a $2-million donation to establish the Stephen A. Jarislowsky Chair in Central Banking in the Department of Economics. The donation, from The Jarislowsky Foundation, will be matched by Western University and will encourage excellence in teaching, mentorship and research in areas essential to central bank policy and decision-making. The creation of the Stephen A. Jarislowsky Chair in Central Banking will ensure Western is at the forefront of central bank policy and decision making, both in Canada and across the world. Building on the research excellence in the faculty, the Chair will conduct top research and provide an opportunity to bring an internationally known expert to the Western community. The Chair will be involved in an original and innovative research program that will help shape central bank decision-making. Since the late 1970s, the Department of Economics at Western has been internationally recognized for its strength in monetary economics. Led by the work of David Laidler, Michael Parkin, and others, Western has been the destination for training in central banking. Graduates from the Economics department have gone on to hold key appointments in Central Banks around the world. Carolyn Wilkins, Timothy Lane, and Tiff Macklem, are all current or former deputy governors of the Bank of Canada. Stephen Poloz is the current Governor of the Bank of Canada, and Glenn Stevens is the current Governor of the Reserve Bank of Australia. The Jarislowsky Foundation provides donations and grants to fund university chairs and medical equipment purchases. Since its creation in 1991, by Canadian businessman and philanthropist Stephen A. Jarislowsky in, the foundation has contributed to numerous initiatives in health, science, the arts and education.